In this chapter, I explore a view of granular computing as a paradigm of human-inspired problem solving and information processing, covering human-oriented studies and machine-oriented studies. By exploring the notion of multiple levels of granularity, one can identify, examine and formalize a special family of principles, strategies, heuristics, and methods that are commonly used by humans in daily problem solving. The results may then be used for human and machine problem solving, as well as for implementing human-inspired approaches in machines and systems. The triarchic theory of granular computing unifies both types of studies from three perspectives, namely, a philosophy of structured thinking, a methodology of structured problem solving, and a computation paradigm of structured information processing. The stress on multilevel, hierarchical structures makes granular computing a human-inspired and structured approach to problem solving. In two recent papers, J.T. Yao (2007, 2008) presents a ten-year review of granular computing by analyzing published papers collected from the ISI’s Web of Science and the IEEE Digital Library. The objective is to “study the current status, the trends and the future direction of granular computing and identify prolific authors, impact authors, and the most impact papers in the past decade.” The results from such a citation analysis shed new lights on the current research in granular computing. For example, it is found that the current research is dominated by fuzzy sets and rough sets, and the number of granular computing publications has a linear growth rate. According to a study by Crane (1972), this indicates that members of the granular computing community have less interaction with each other and with researchers in other areas. To promote granular computing as a field of study, J.T. Yao (2007) makes several recommendations. We must first search for and adopt a set of common terminologies and notations so that we can easily find granular computing papers and increase effective exchange of ideas. We need to interact and communicate with each other and with researchers in other fields. An immediate task is to establish a conceptual framework of granular computing, within which many views, interpretations, and theories can be developed and examined. Although a well-accepted definition and formulation of granular computing does not exist yet, recent results show a great diversity of research and a convergence to a unified framework. Initiatives include granular computing as a way of problem solving (Yao, 2004a, 2004b, 2007a; Zhang and Zhang, 2007), granular computing as a paradigm of information processing (Bargiela and Pedrycz, 2002, 2008), artificial intelligence perspectives on granular computing (Yao, 2008b, Zhang and Zhang, 2007), connections between granular computing and systems theory (Yao, 2008b), a general theory of granularity (Hobbs, 1985; Keet, 2006, 2008), and a triarchic theory of granular computing (Yao, 2000, 2004a, 2004b, 2005, 2006, 2007a, 2008a, 2008b). Granular computing is evolving from a set of simple concepts and notions into a field of interdisciplinary and cross-disciplinary study. It draws results from many fields and synthesizes them into an integrated whole (Yao, 2007a, 2008b). One purpose of this chapter is to examine a view of granular computing as a paradigm of human-inspired problem solving and information processing with multiple levels of granularity. I classify research of granular computing into human-oriented and machine-oriented studies, and discuss two purposes of granular computing, one for humans and the other for machines. Another purpose is to outline the triarchic theory of granular computing with three components integrated. 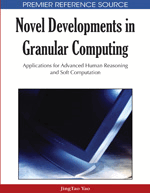 The studies of philosophy of granular computing promote structured thinking, the studies of methodology promote structured problem solving, and the studies of computation promote structured information processing. The classification of the two types of studies and the identification of the two purposes help clarify some confusion about the goals and scopes of granular computing. The view of granular computing as a paradigm of human-inspired computing with multiple levels of granularity is not really new; it simply weaves together powerful ideas from several fields, including human problem solving, computer programming, cognitive science, artificial intelligence, and many others. By revisiting, reinterpreting and combing these ideas, we obtain new insights into granular computing. In the rest of the chapter, I will explain this view with reference to works that have significant influences on my thinking; and hope this will help in appreciating the principles and ideas of granular computing.